Ladies - Broomhilda's Bakery fabric is finally starting to arrive. Helen will soon be starting the first few blocks so you can have an idea of what the blocks will look like. I think this will be a fun project to work on. I know several of you have already purchased the embroidery pattern. If you have not, please let me know so I can order one for you. If anyone is not planning on doing the project, please let me know that too. We will be in touch with you later when we are ready to start. 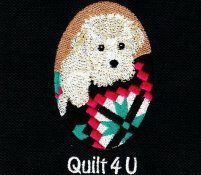 We have also ordered embellishments kits for the project as we thought everyone would want them ....they really make the quilt.